They say that slow and steady wins the race, but these cupcakes seem to inspire a race to see how quickly you can get them in your belly. 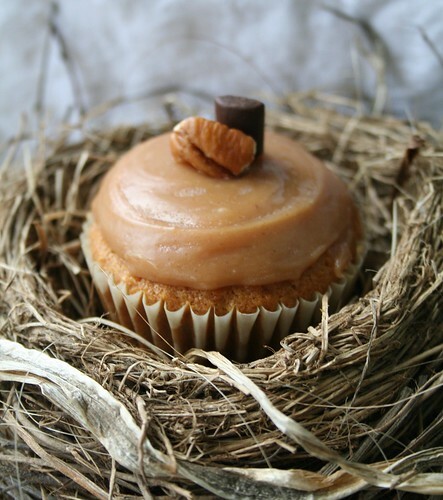 CakeSpy reader Melanie recently sent on this recipe for Tortoise Vs. Hare cupcakes which combine carrot cake with turtle confections--and all I can say is that they are making me want to run, not walk, to the grocery store to buy the ingredients. Based on Melanie's lovely pictures though, it looks like both tortoise and hare win this one! Whisk together flour, soda, cinnamon, baking powder, salt, and nutmeg. In another bowl, beat eggs, sugar, brown sugar, butter, and milk. With mixer on low, add flour mixture a little at a time until just blended. Stir in vanilla, carrots, pecans, and chocolate chunks. Bring the butter, brown sugar, corn syrup and sweetened condensed milk to a boil over medium-high heat stirring to combine. With a wooden spoon, stir all ingredients together and then slowly add the heavy cream. Continue to stir for about 20 minutes until the caramel reached 248 degrees. It is important to continuously stir the mixture and to allow it to reach temperature. Remove from heat and stir in the vanilla and salt. Transfer to a bowl and continue to stir for 2-3 minutes allowing the caramel to cool slightly.